For both the Marine defenders and their North Vietnamese adversaries, the military base at Khe Sanh was the center of a deadly serious chess match between two determined commanders. In early 1967, the thinly populated, rugged, and mountainous Khe Sanh plateau lay in the northwest corner of South Vietnam, bordered by Laos to the west and the Demilitarized Zone (DMZ) and North Vietnam to the north. The vast region was obscured from aerial observation by high, dense, triple-canopy foliage. Elephant grass and bamboo thicklage, recruiting Bru montagnard villagers into a Civilian Irregular Defense Group (CIDG). That September, another Special Forces detachment arrived to oversee the construction of a rudimentary but fully operational air strip. The village was located on Route 9, an old one-track French road linking the Vietnamese coast with Laotian market towns along the Mekong River. Roughly 1,500 people lived in the village, with another 10,000 Brus living in a dozen villages scattered nearby. In April 1966, a Marine battalion passed through the area during a sweep-and-clear operation. That October, after the airstrip had been improved and lengthened, the 1st Battalion, 3rd Marine Regiment (1/3) and an artillery battery moved into the base at the urging of General William C. Westmoreland, commanding general of American forces in South Vietnam. Westmoreland had begun looking at the base as a potential jumping-off point for future operations in Laos against the Ho Chi Minh Trail, the major North Vietnamese infiltration route into the south. The arrival of the Marines forced the Green Berets to relocate to a new base camp nine kilometers to the west at Lang Vei. In early 1967, the North Vietnamese Army (NVA) began moving large numbers of troops into the hills north of Khe Sanh. That April and May, vicious fighting broke out when the Marines battled the NVA for control of three hilltops overlooking the base in what became known as the Hill Fights. The Marines of 1/3 moved out against Hills 861, 881 North, and 881 South west of the village. Two NVA regiments were waiting, dug into a superb system of camouflaged bunkers. Lt. Gen. Robert Cushman, III Marine Amphibious Force commander, rushed another battalion of infantry to Khe Sanh when the fighting intensified. Marine air strikes and artillery helped blast the enemy off the hills. On May 5, after 12 days of fighting, the Marines gained the last of the three hills; 160 Marines died and another 700 were wounded. The number of confirmed NVA dead totaled 940, with many more wounded. The NVA moved their battered forces east and began harassing the Con Thien combat base. On May 11, the 1st Battalion, 26th Marine Regiment (1/26) replaced the 3rd Regiment. One company of Marines from 1/26 was posted on Hill 881 South and another on Hill 861. On May 13, the headquarters battalion of the 26th arrived at Khe Sanh; in mid-1967, a Marine pacification company and a South Vietnamese Regional Forces company took up positions at Khe Sanh village. These moves were meant to deny the NVA an invasion route through Laos into the heart of Quang Tri province. In August, the North Vietnamese ambushed a Marine convoy en route west to Khe Sanh; the convoy turned back and the Americans reluctantly acknowledged the closure of Route 9. Soon, U.S. intelligence detected parts of two or three enemy divisions, backed by two artillery regiments, moving toward Khe Sanh. Westmoreland responded by building up Marine strength and began making plans to have giant B-52s deluge the attackers in a devastating bombing cascade dubbed “Operation Niagara.” The Marines moved to strengthen their defenses. Unfortunately, they were short on engineering materials, and the local lumber was substandard. On December 13, the 3/26 deployed to Khe Sanh. Colonel David Lownds, the regimental commander, now had all three of his battalions on hand at the base. Westmoreland traveled to Washington in the late fall of 1967 full of optimism—he could taste victory. He claimed that the North Vietnamese and their South Vietnamese allies, the Viet Cong, had reached the “crossover point,” the point at which they were suffering so many casualties, prisoners, desertions, and illnesses that their ability to replace their losses through recruitment and infiltration had been exceeded. In the face of such worsening news, the North Vietnamese leaders, stung by reverses on southern battlefields and fearful of an American invasion of their homeland, instituted a major change in strategy. They conceded that their protracted-warfare tactics weren’t working. Instead, if the Communists determined that the United States was not going to launch a northward invasion, they would implement a three-phase winter-spring offensive to encourage a spontaneous uprising in the South. At the same time, they would begin implementing political and diplomatic initiatives. The fight-negotiate scheme had worked well against the French; now it would be used against the Americans. The Politburo issued Resolution 13, which spelled out the change in strategy and called for a general offensive and uprising to take place in early 1968. North Vietnamese chief of staff and minister of defense General Vo Nguyen Giap, one of the group known as the “North Vietnam-firsters,” opposed the plan. He still believed that an American invasion of North Vietnam, Laos, or both was the biggest threat. Accordingly, he kept 300,000 NVA troops at home; every hamlet and village had prearanged bunkers and fighting positions. Even schoolgirls took bayonet training. Because of Giap’s opposition to the new Politburo plan, command of the offensive was given to Viet Cong leader General Nguyen Chi Thanh, but when Thanh died in July 1967 after being wounded in an American bombing raid, Giap was given the task of planning and carrying out the 1968 offensive. Giap ordered a series of attacks near the DMZ to see how the United States would respond. 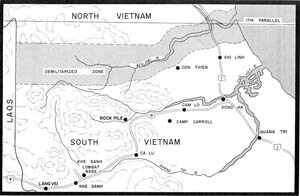 Repeated attacks against Cam Lo, Con Thien, the Rockpile, Khe Sanh, and Camp Carroll served as the test. Giap deployed almost six divisions in or near Quang Tri province for these attacks. When Westmoreland responded by sending more units and firepower into the area but not crossing the DMZ, Giap had his answer: no American invasion of his country was forthcoming. He immediately ordered the three-phase offensive to begin. In Phase I, lasting from October to December 1967, the NVA and Viet Cong would mass forces and conduct battles along the border regions of the Central Highlands to attract U.S. units and allow the Viet Cong to infiltrate into the cities to prepare themselves and the civilian populace for the upcoming offensive. This article is from the June 2005 issue of Military Heritage Magazine. If you would like to read the rest of this and other articles, visit our order page to see which digital editions we have on offer. Tags Ho Chi Minh, Ho Chi Minh Trail, Khe Sanh, Marines, Spring Offensive, Viet Cong, Vietnam.